I’ve always loved that saying. Don’t know why, exactly, but I suppose it has to do with the directness of the statement, the idea that one can utter 5 words to clearly convey a depth of experience on the matter at hand. The first time I ever heard it was in the movie Mommie Dearest…shudder. More recently, Payton’s 6th grade speech & theater teacher, Ms Pointer, used that saying at parents’ open house at the middle school. The first-time middle-school parents, trying to navigate the newness and independence thrust upon us and our little darlings, showed up at school with our kids’ schedules in hand and followed their class schedule for an intro to middle school by each teacher. From one end of the school to the other, upstairs, downstairs, down the hallway and back we traipsed, just as our kiddos do every school day. I tried to picture my 6th grader going from class to class in this giant building that houses some 1,100 kids, and was frankly, a little overwhelmed. Ms Pointer, one of the more beloved teachers at FCMS, is direct and has high expectations–my kind of girl. She reassured all the nervous parents in the room that she would turn our babies from shuffling, eyes-downcast pre-teens to confident public speakers who present themselves proficiently and engagingly. My boy isn’t the most, uh, talkative, and I did worry a bit about his choice of speech & theater as his elective (“it beats band, orchestra, and choir” was his rationale). But Ms Pointer assured each parent in the room that night that she could work her magic and coax even the most reluctant kid out of his/her shell. “This isn’t my first rodeo,” she said. And she was right. Not only did my guy deliver his speeches with elan, he also learned to sew — with fabric, needle, and thread — a tiny costume for an action figure. He needed a Barbie or Ken doll, but seeing as his sister isn’t exactly the Barbie type, and his mama didn’t want to trek over to Target that day, we scrounged around in the discarded playthings box and found a Troy Bolton doll from High School Musical. My kid transformed the doll from teen basketball star to an ancient Chinese warlord in full battle gear, happily and with no needle pricks, thanks to Ms Pointer. I remember well Ms Pointer uttering that saying, and I thought of her yesterday as my favorite girl and I headed out for the rodeo. It’s a big event in these parts, and she had eagerly anticipated our visit. 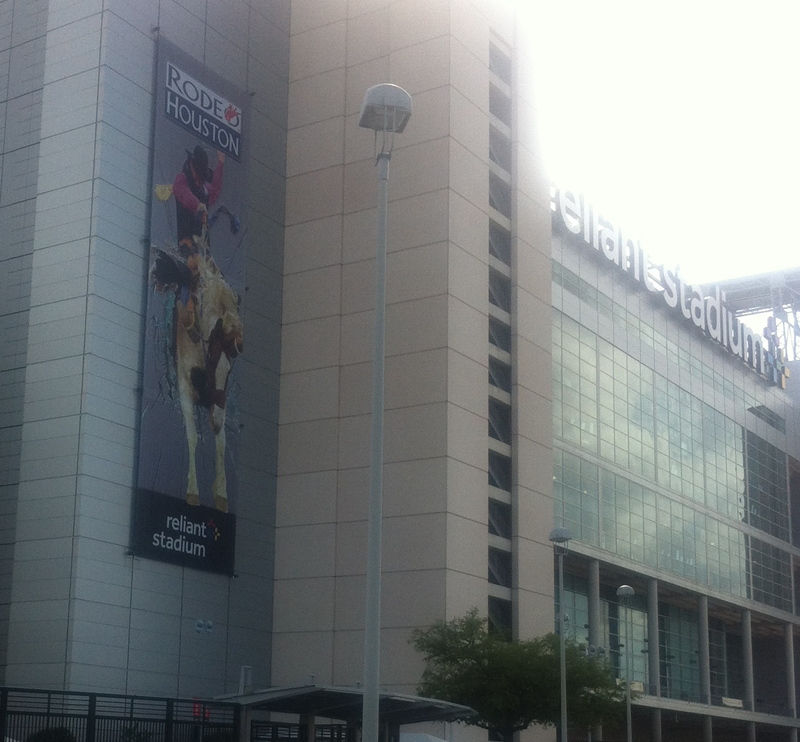 This year is the 80th annual Houston Rodeo & Livestock Show. For 80 years, my fair city has been putting on this event, and it’s quite the spectacle. 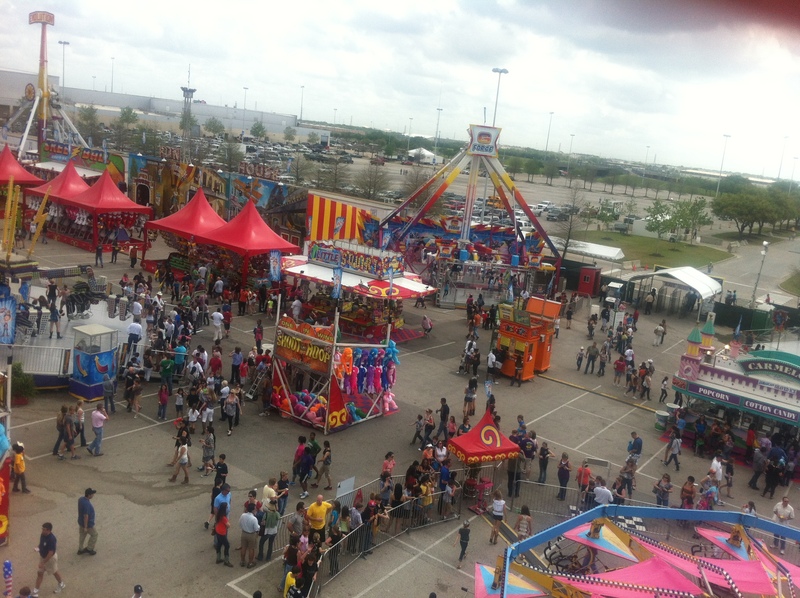 For 19 days every spring, hordes of people come to the rodeo — attendance tops 100,000 on weekends. No doubt the rodeo has evolved over the years, and it now encompasses not just ropin’ and bull ridin’ and carny entertainment, but big-name performers, a world-class BBQ championship, horse shows, wine tastings, sheepdog trials, and all kinds of fun. The muttin bustin’ has quickly become a crowd favorite. There’s plenty of swagger at the rodeo, from the giant belt-buckles on the guys to the sundresses & cowboy boots a la Taylor Swift on the girls to the 10-gallon hats on the seasoned ranchers. 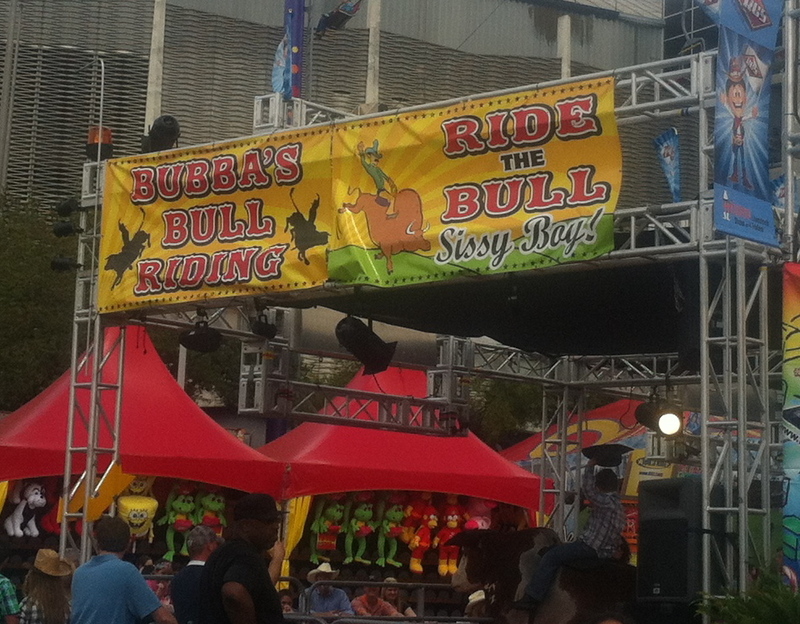 I especially liked the sign on this bull ride; the Sissy Boy part made me laugh. My little cowgirl was 3, and she reveled in the sights and sounds of the big event. 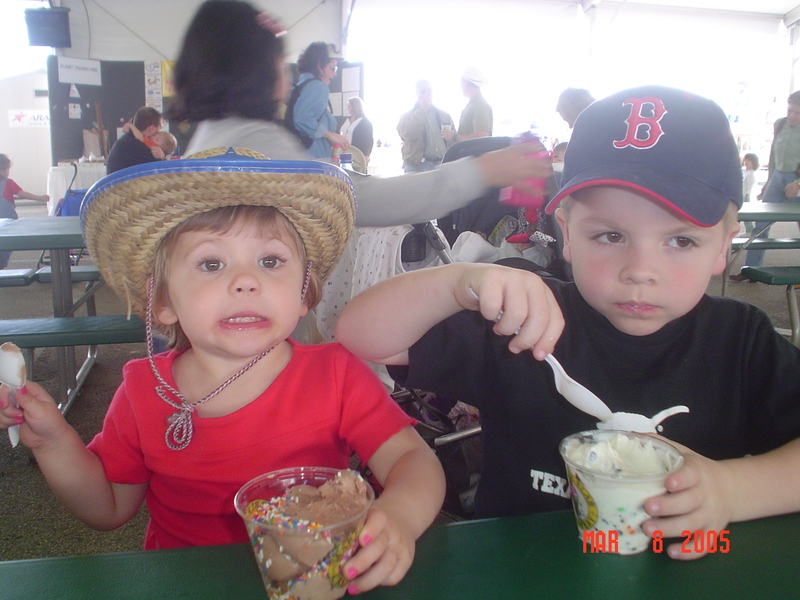 The cowboy next to her was 6, and was a bit more interested in the giant ice cream than anything else. This is the kind of ride they enjoyed back then. And this is the kind of ride my girl enjoys now. Let me state for the record that I am not an amusement-park kind of girl. I don’t enjoy the rides, the crowds, the footsore grumps who are tired of waiting in line. It’s not my scene. I’m also a little teeny bit scared of heights. And jerky motions. And flunky ride-operators who hold my life in their hands as they operate thousands of pounds of machinery that may or may not have been properly inspected. 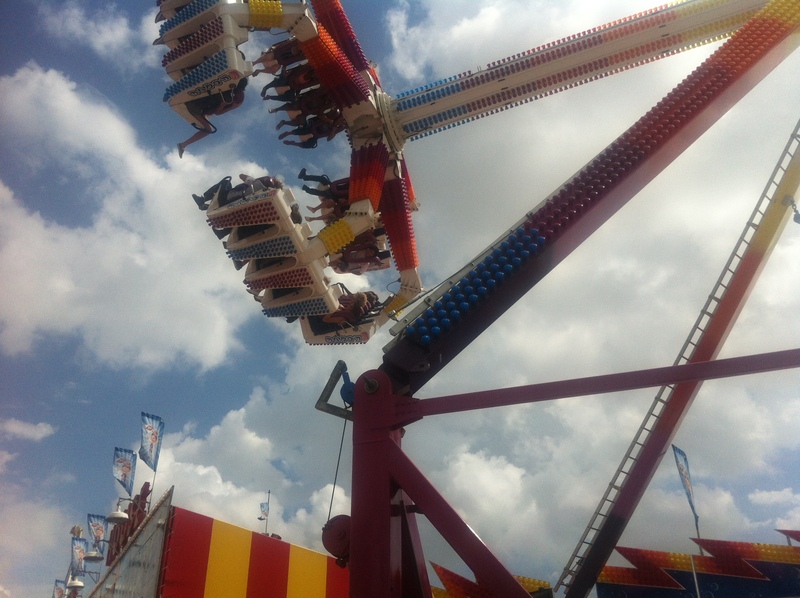 There’s even a website devoted to chronicling accidents on carnival rides, after all. Yikes. But hey, my girl wanted to ride some rides, and she wanted me to do it with her. I’ve already faced the scariest thing I can imagine — a cancer diagnosis — so surely I could handle the Sky Flyer. Which happens to be the tallest swing ride in North America. Oh goody. Here we are in our swing, ready to soar over the rodeo crowd. I’m terrified. Seriously. 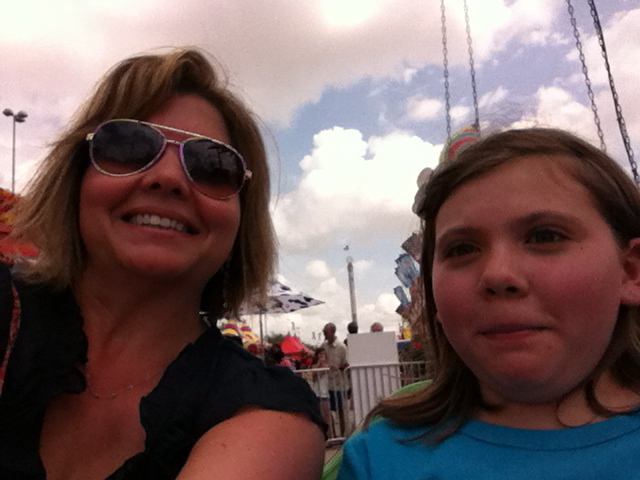 My girl is in disbelief that her otherwise-fearless mama is actually riding this ride. Aerial view as we began our ascent into the sky. Up high. Very, very high. Looking down at lots of pavement and people and pointy things that would not cushion a fall. But we survived, with a complete absence of screaming and a minimal amount of cussing by me. My girl was very proud of me for doing something she knows is way, way, way outside my comfort zone. 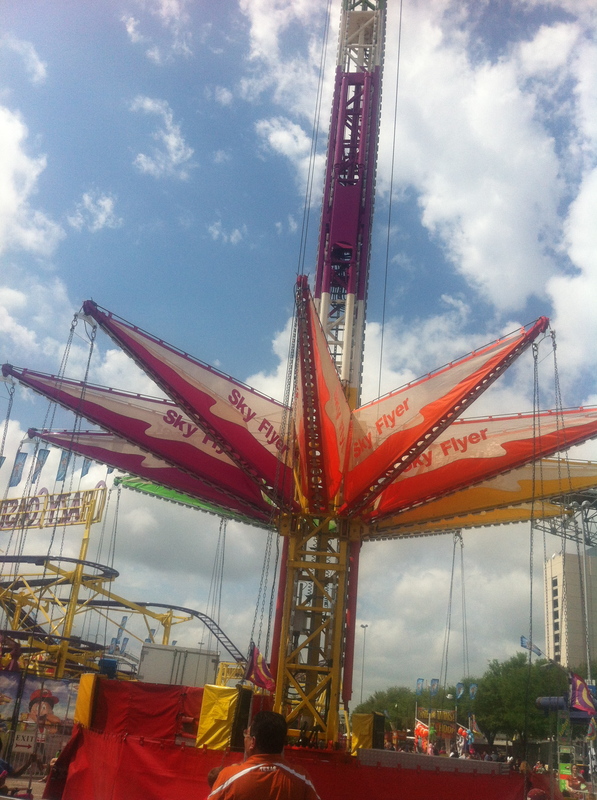 As we exited the Sky Flyer, a girl in her early teens asked me, “Is it scary? How high do you think it goes? Does it last long?” She must have recognized a fellow reluctant rider. I wish we’d stuck around to see if she was convinced by my answers enough to hop on. 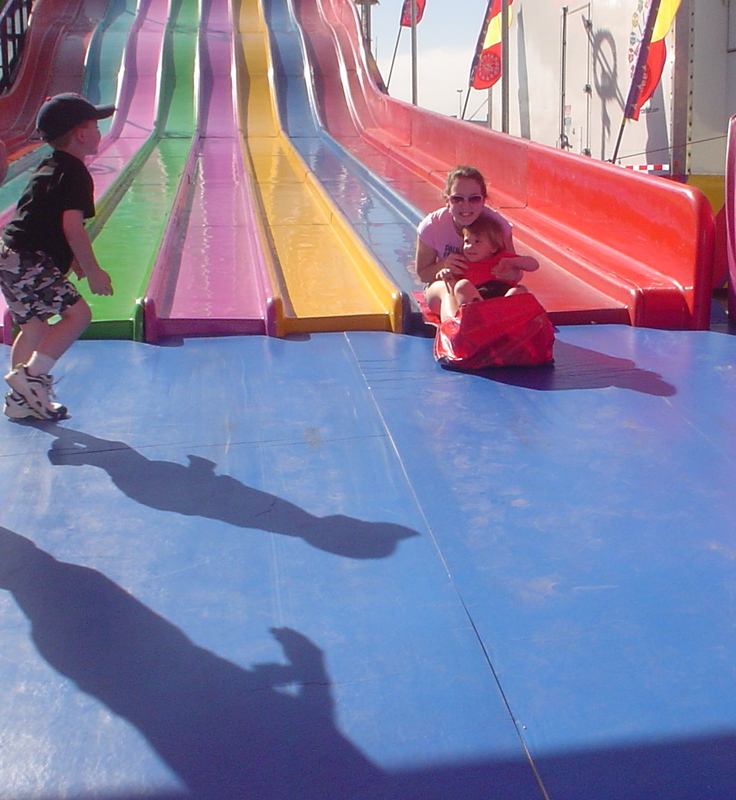 But no, we had to hustle on over to the G Force. My girl had heard about this ride or remembered it from last year or something. 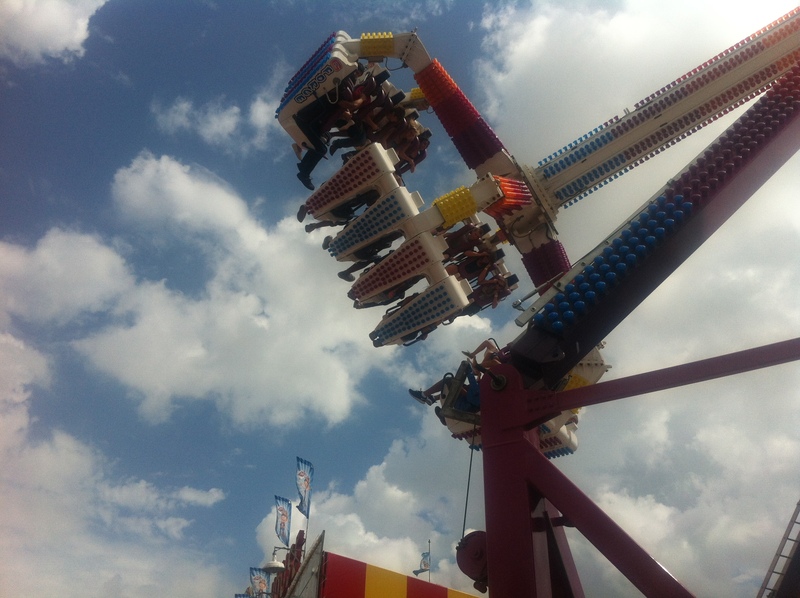 I can’t recall because I stopped breathing when I saw it and was focused on remaining upright as I saw people hurtling through the sky on this G Force of death. Really?? People pay money to ride this?? On purpose?? 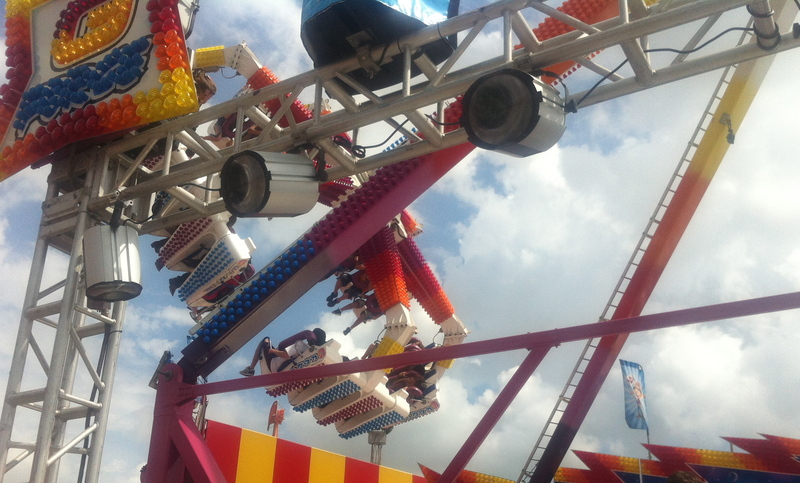 20 people, in groups of 4, get strapped into this thing, which hurls them from side to side and around in circles as it swings back and forth, climbing ever higher into the sky. It swings in great arcs that cover a huge swath of landscape over the midway, traveling fast enough to elicit the unit of force equal to the force exerted by gravity. 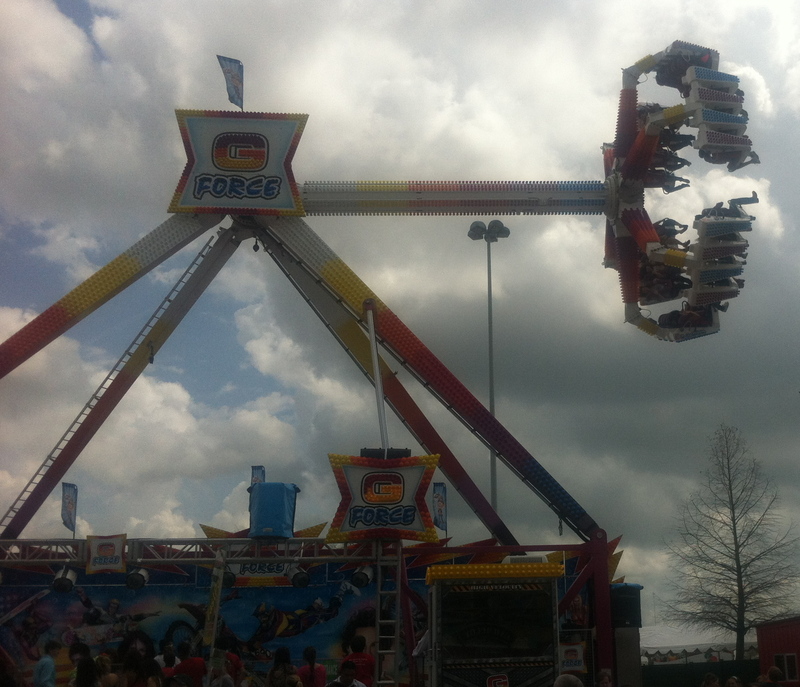 The force to which a body is subjected when it is accelerated by a crazy carnival ride. Which may or may not have been properly inspected. I’m thinking you’d have to be cuckoo to ride this thing. 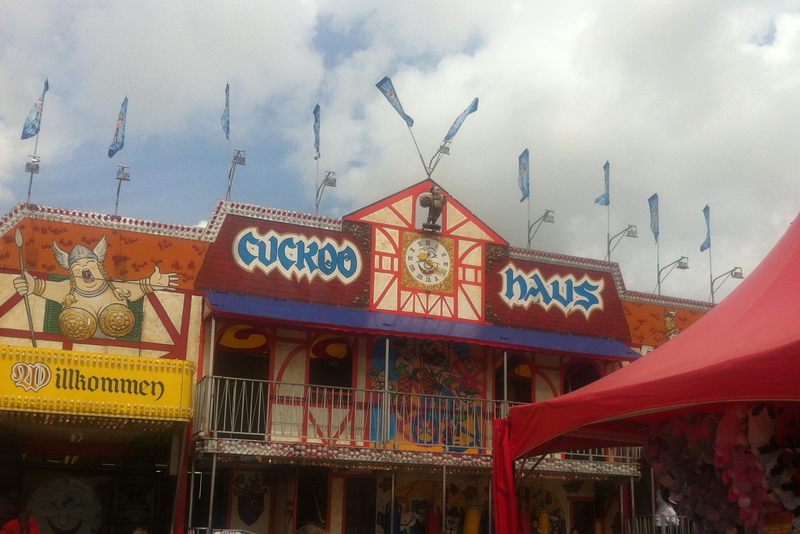 And lo and behold, there’s the cuckoo house right across from the G Force. Well, guess who rode the G Force? Yep, that’s right–it was me. The gal who really doesn’t like rides. At all. Of any kind. The gal who is perfectly happy to hold purses, hats, cell phones, drinks–whatever, as long as I don’t have to go on a ride. The control-freak gal who hates putting her fate in someone else’s hands. Uh huh, I rode the G Force. All for my favorite girl. It was scary, ok terrifying really, and people were screaming. Some people were actually smiling. My girl reached over to hold my hand, and told me it’s ok to scream but please don’t cry. I did neither, although one time I extolled the ride operator to make it stop. 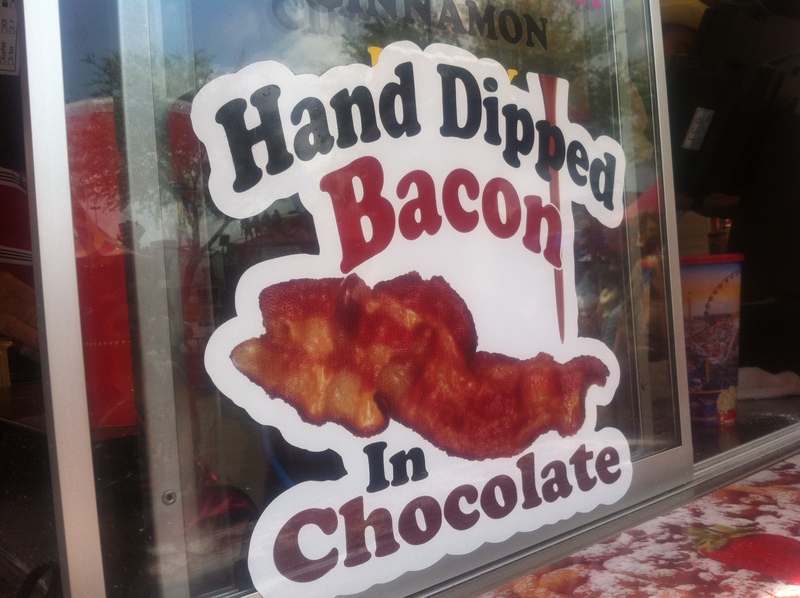 For the love of all things sacred and holy, make it stop. 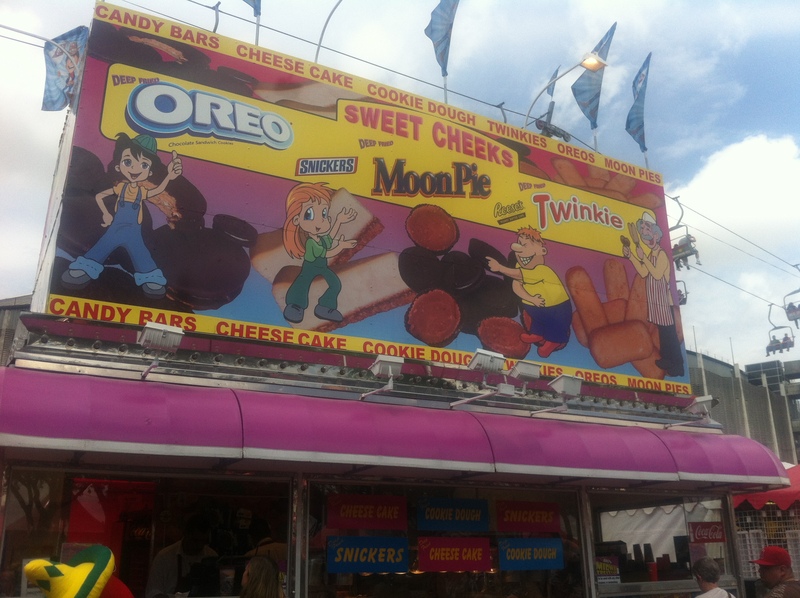 After surviving the G Force, we were ready to sample some of the fine delicacies the rodeo is known for, and the choices were plentiful. This one, we skipped. Ewwwwww. This, however, is what my girl wanted. 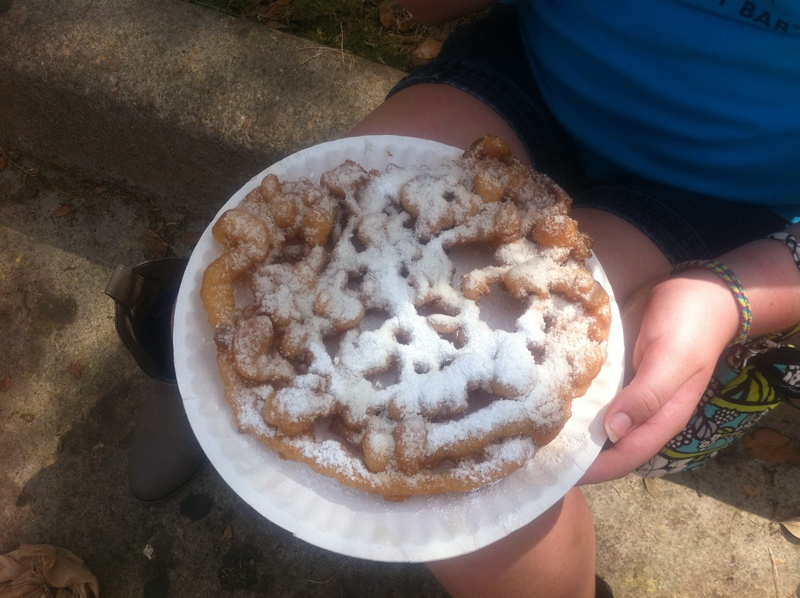 She’d never had a funnel cake and was jonesing to try it. She pronounced it heavenly, and only scowled at me a little when I encouraged her to throw half of it away. We won’t mention the giant stomach ache she ended up with after consuming half of that bad boy. 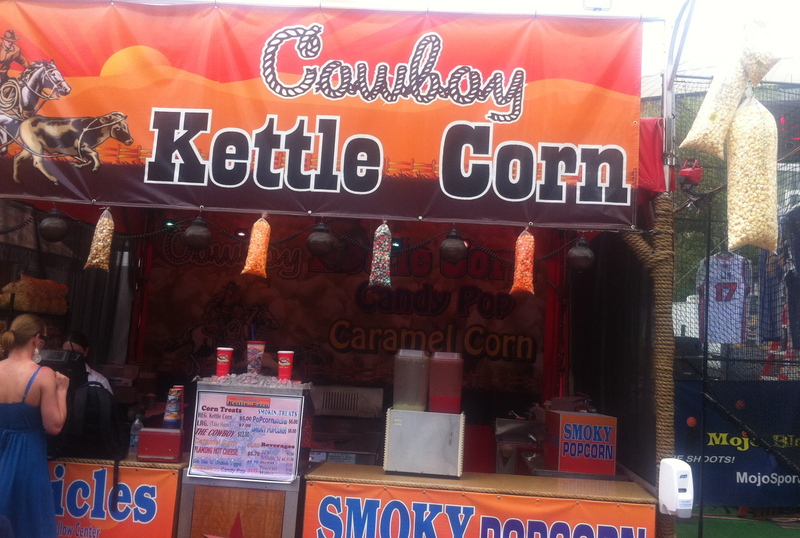 We skipped the Cowboy Kettle Corn, but I do like the Texas-sized bag on the right. 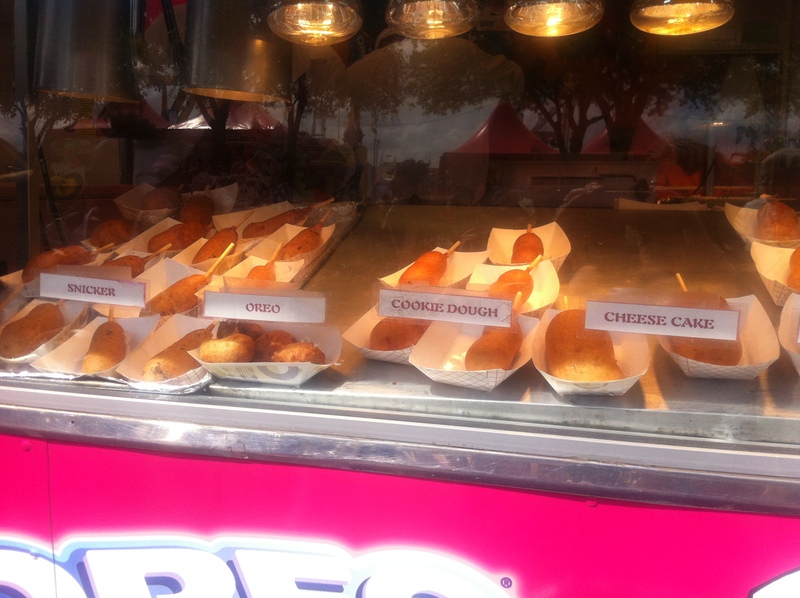 Sweet Cheeks is well-known for its fried desserts on a stick. 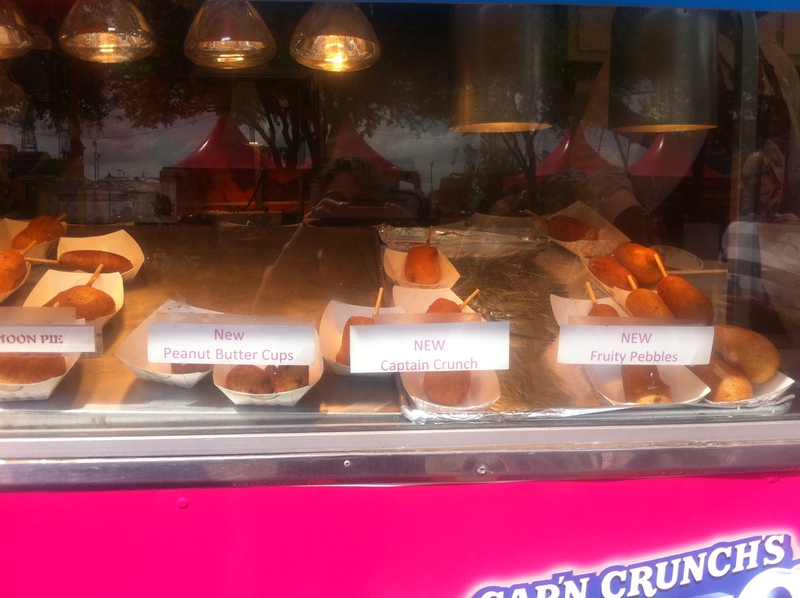 The fried Snickers bar made headlines when it debuted, and this year’s addition to the lineup is Fried Fruity Pebbles. Apparently they coat the cereal in melted marshmallows, form it into a rectangle, add a stick, dunk it in batter, and fry it. Plenty of people lined up for the non-health-food-store wares. After the sweets we happened upon the meats. 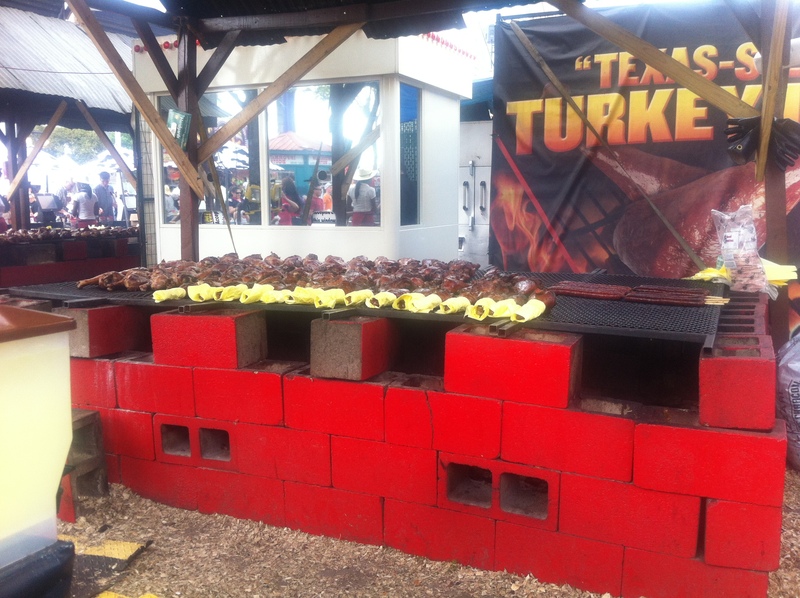 The Texas-sized turkey legs are popular. Lots of carnivores were strolling the midway while gnawing on a turkey leg. 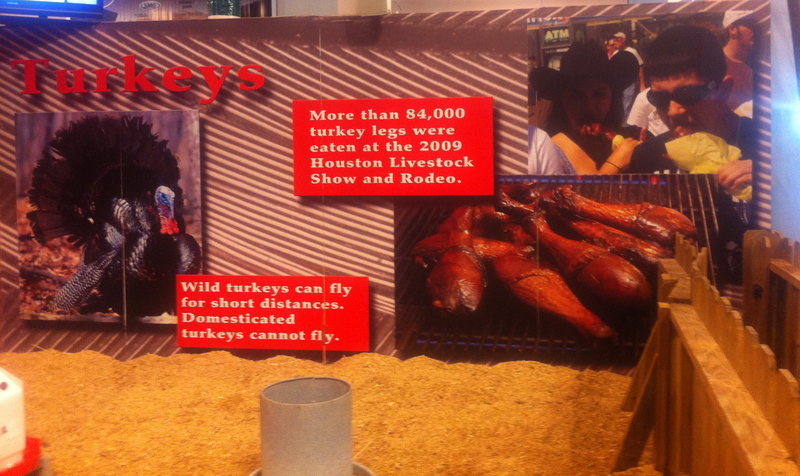 Inside, at the livestock show, I noticed this sign about just how many turkey legs are consumed at the rodeo. That’s bad news for this guy. Tom Turkey better rest while he can, because before long, it’ll be curtains for him, and lunch for someone else. 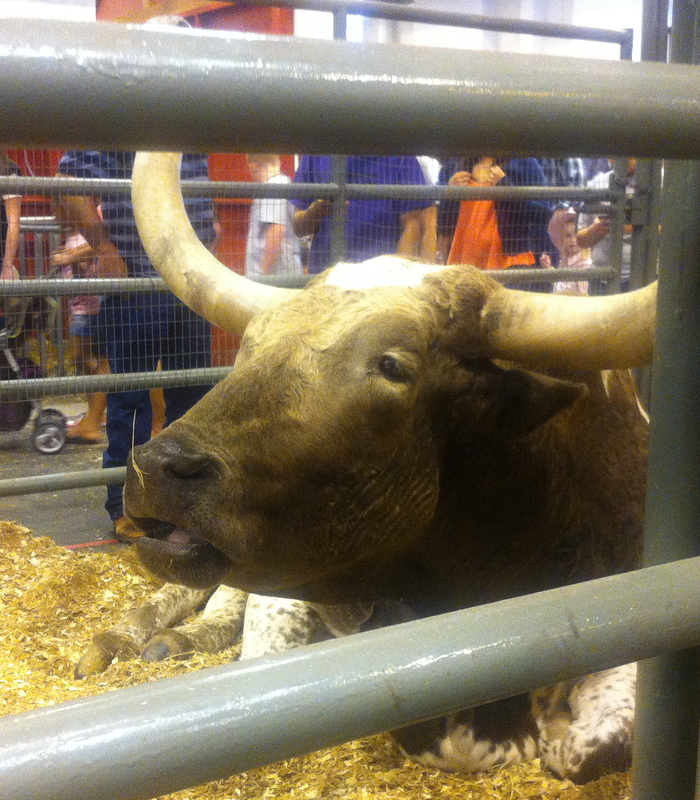 Seeing the animals is always a highlight at the rodeo. 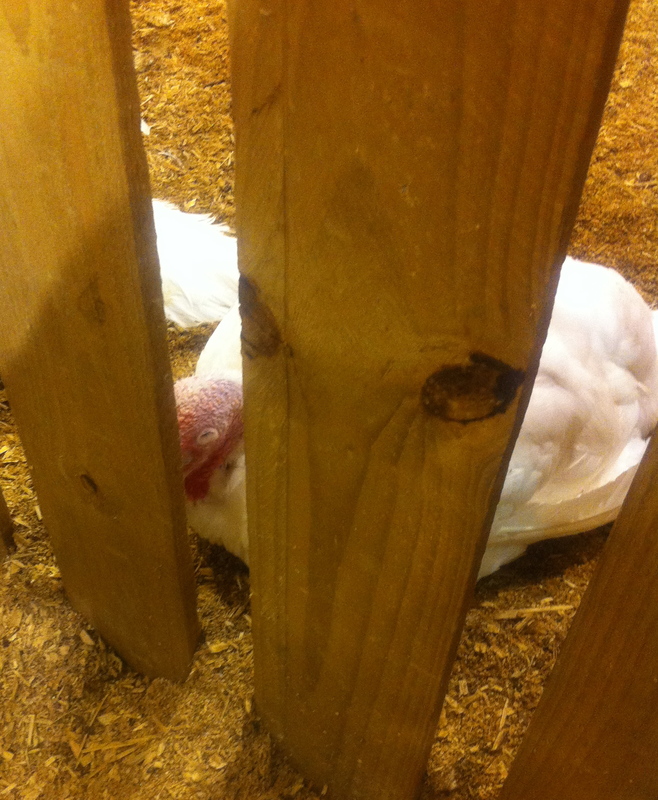 The local FFA kids work really hard to raise and show their animals, and hope for a big payoff. The rodeo has resulted in some $238 million in scholarships, research, and youth programs. This longhorn looked like he had something to add to the topic. Perhaps it’s that some 2,000 students attend more than 100 different Texas universities on livestock show scholarships, enjoying $30 million in school funds. 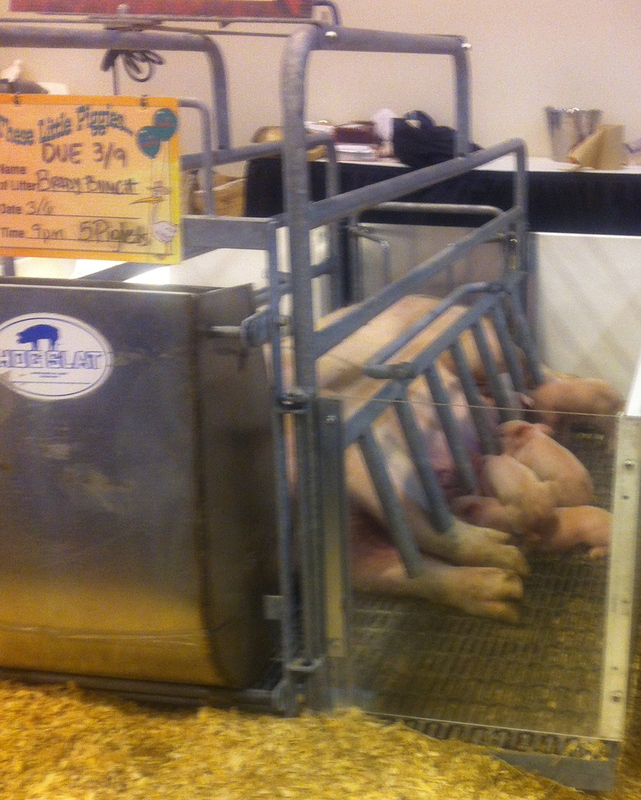 We saved the best for last at the livestock show: the birthing center. The tally board shows the babies born at the rodeo, and of course our eyes went straight to the column that lists the piglets. 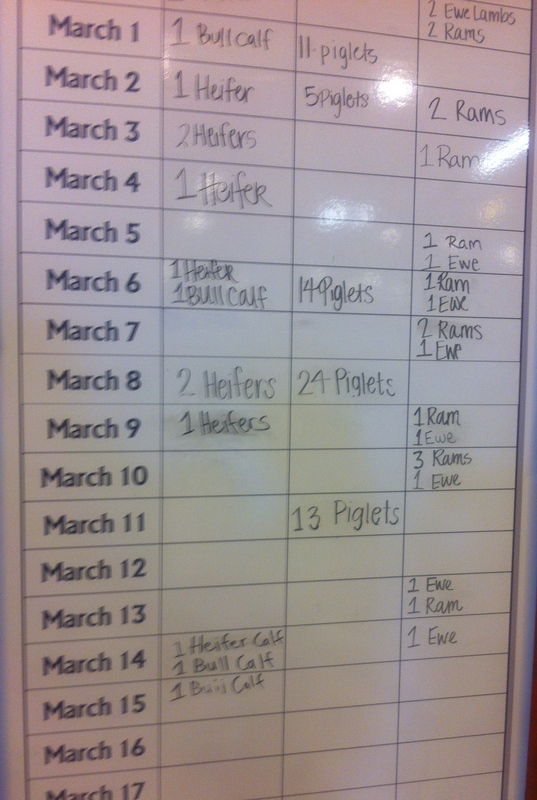 As of yesterday, 67 piglets had been born at the rodeo. That’s a lot of little squealers. We saw some of them, and could have stayed all day watching them. Yes, those are the mama pig’s hooves you see, and yes, they are indeed bigger than her babies. Mama pig weighs 600 lbs, so her hooves have to be able to support her heft. 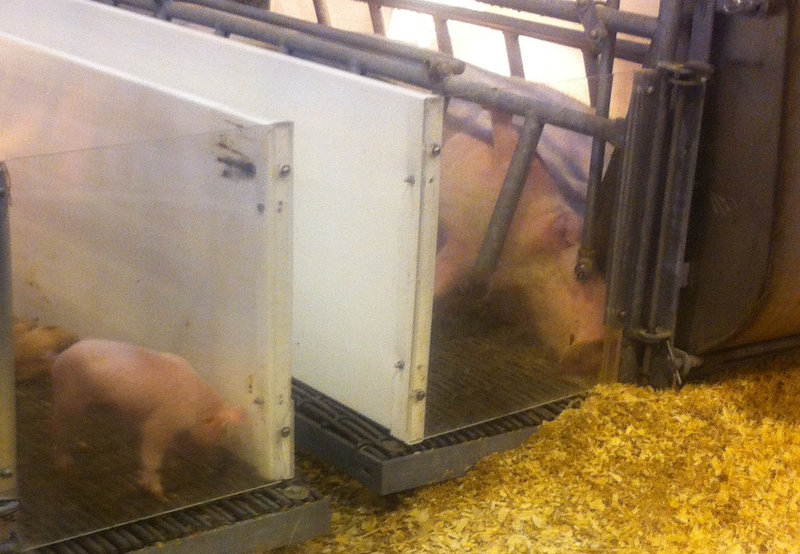 Those piglets are a week old, and their mama’s hooves could crush them. Miss Piggy is the proud mother of 5, all of whom were ready for their next meal. Next to Miss Piggy’s little family was another brood named The Brady Bunch. Why some of the mama pigs were in the clear enclosures with the scary-looking bars near their faces and some were in more friendly fenced enclosures I don’t know. 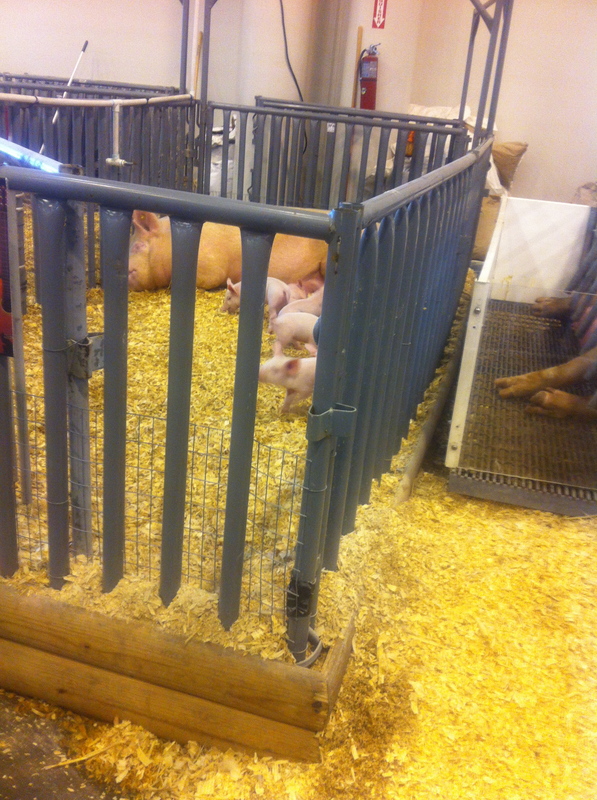 Perhaps the scary-looking pens were for feeding and the fenced ones were for piggie playtime? The fenced ones allowed the piglets to run and play, and Macy and I loved watching them cavort like puppies. Piglets galore! 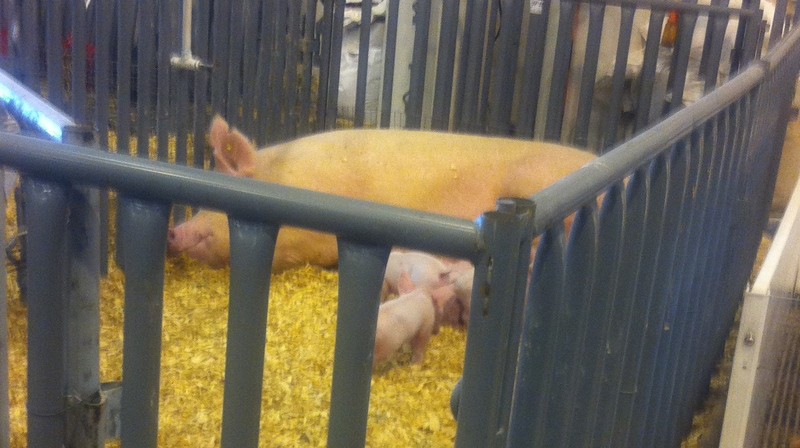 This mama pig snoozed while her little ones entertained each other. 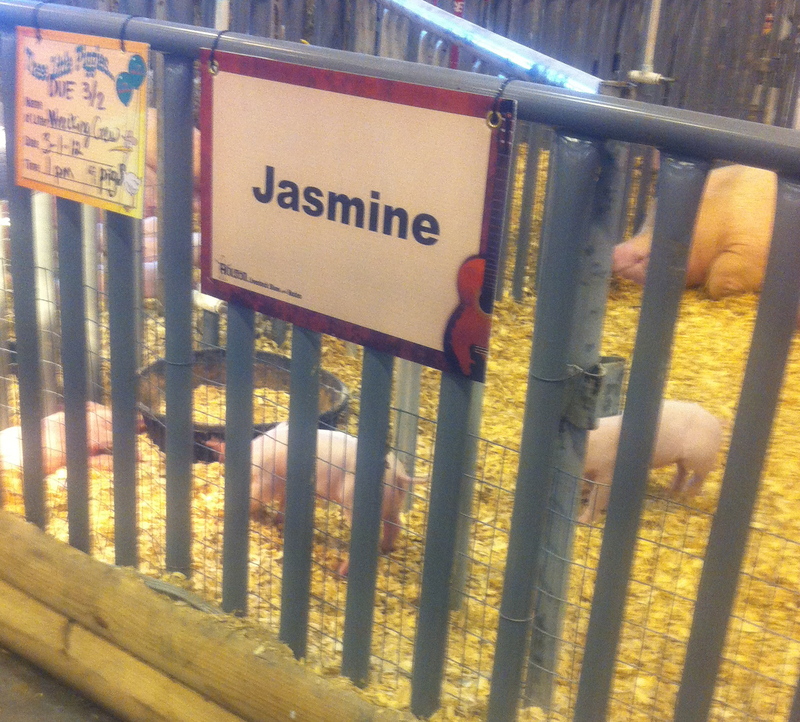 So did Jasmine, as her 5 piglets, named The Wrecking Crew, delighted the crowd with their piggie antics. The Wrecking Crew at work. 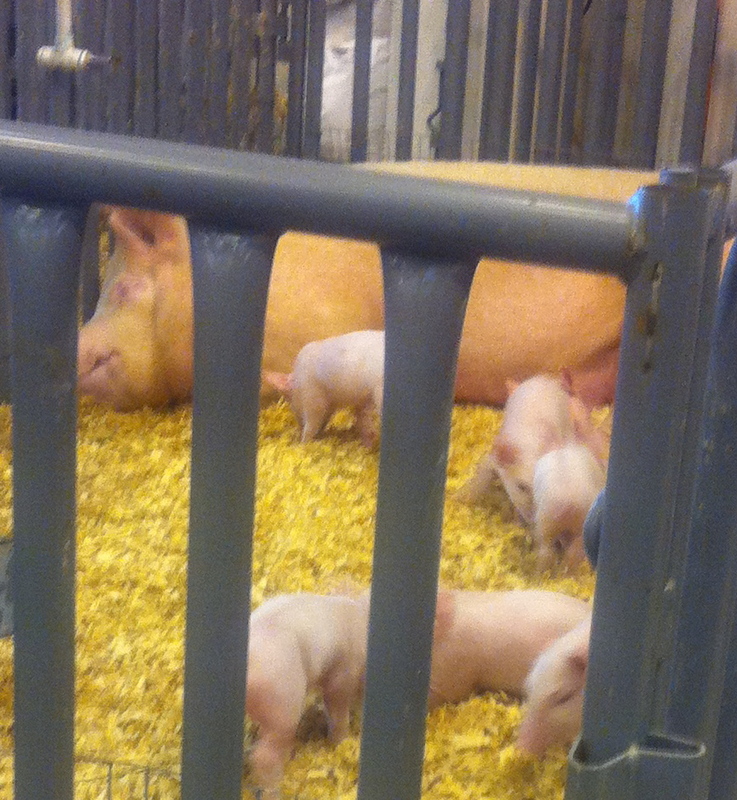 Seeing the piglets was the perfect ending to our rodeo fun. After gazing upon their little pink faces, there was only one thing left to do: go to the pig races! I’m happy to ride all the rides, but keep me away from all that fried food! Piggie races sound fun. I’ll stay tuned. Yeehaw!! After riding those rides you should be ready to drive the tollway bridge over the ship channel! Kudos to you for making your girl’s day. How fun! Ride-’em, cowgirls! Love Kettle Korn! 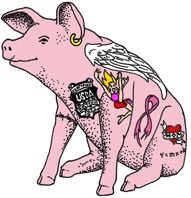 I’m so proud of you…I cannot bring myself to get on any of those rides…hoping the piggies were safe…we had an upsetting experience at the state fair around the piggies…so hoping it was positive for you all! Mom of the year for going on those rides! I couldn’t do it! The rodeo looks like a very fun tradition. You sound great! When I (finally) woke up from my failed surgery last year Dr. S. said “Don’t worry, this isn’t our first rodeo”. It seemed so incongruous coming from her. Now I will forever believe she must have gotten the phrase from you! Do you ever remember saying it to her?